My first experience with carrot salad? The grated version that’s loaded with raisins and walnuts and drowning in a super-sweet dressing. It was perfect for my tween palate, which hadn’t begun to appreciate most vegetables, but these days I’m looking for more depth and balance than that overly sweet, kid-friendly dish. 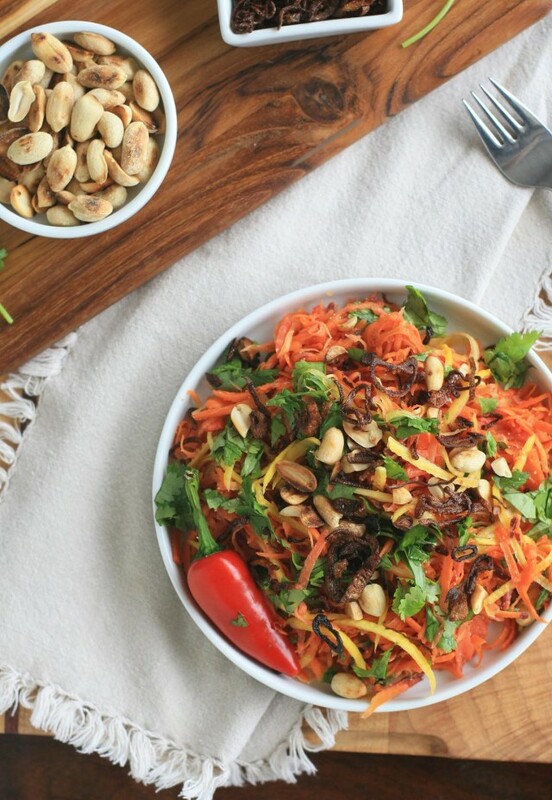 In this Burmese carrot salad, a mound of grated carrots is dressed in fish sauce and lime juice and tossed with crunchy peanuts, golden crispy shallots, and minced Jalapeno. A hefty amount of cilantro provides that ubiquitous Southeast Asian pop of freshness while toasted chickpea flour and shrimp powder adds plenty of savory umami. 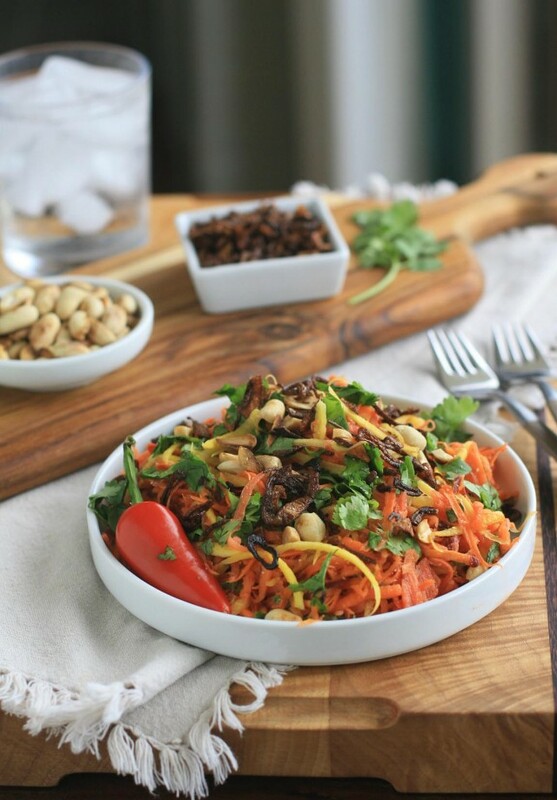 For fans of Thai or Vietnamese green papaya salad, you might be surprised to hear that this carrot salad has a very similar texture and flavor. That’s great news for any of you who love the taste of green papaya salad, but don’t have an extremely well-stocked Asian market where you live. No green papaya? No problem. Plain ol’ supermarket carrots would work just fine for this recipe, but I couldn’t resist making this with some colorful heirloom carrots from the farmer’s market. 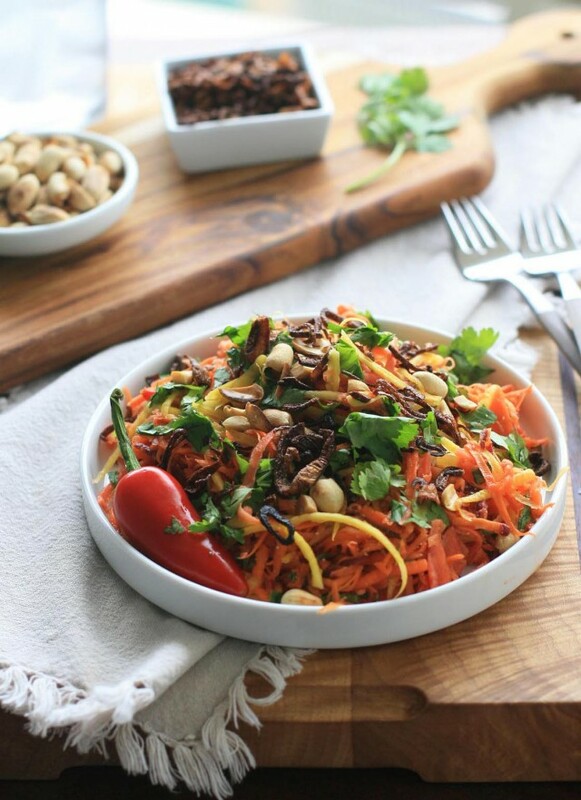 I wanted to keep this as a lighter side dish so I resisted adding extra protein, but like green papaya salad, I bet it would be great with some shrimp or even chicken. Combine the carrots, lime juice and fish sauce in a large bowl. 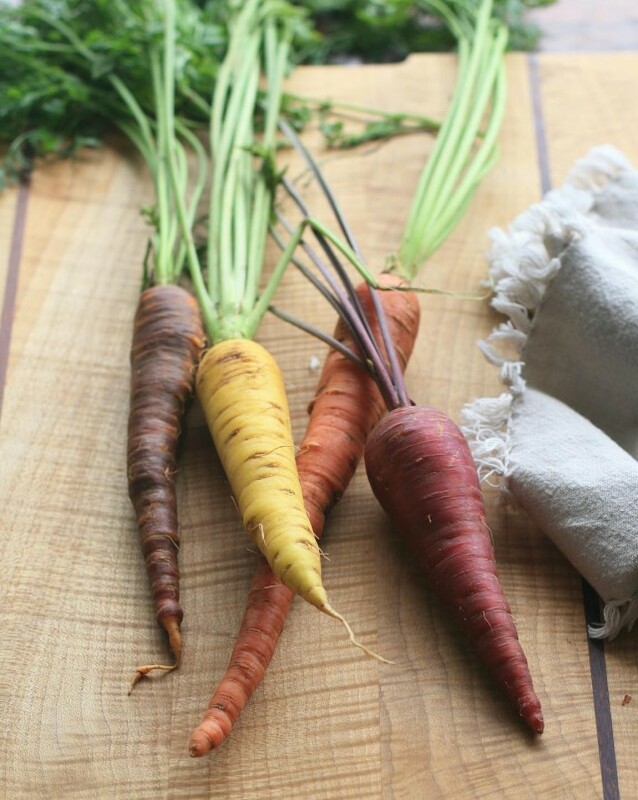 Use a wooden spoon to gently pound or press the carrots to help break them down a bit, about 3-4 minutes. Add the shrimp powder, toasted chickpea flour, Jalapeno pepper, salt, peanuts, shallots and cilantro and toss. Transfer the mixture to a shallow serving bowl and serve immediately.